Three titles decided on the penultimate day of play, Saturday 19th January, at the Seamaster 2019 ITTF World Tour Hungarian Open in Budapest; all went to China. Xu Xin and Liu Shiwen emerged mixed doubles champions, to be followed by Wang Manyu and Zhu Yuling who secured women’s doubles gold. Later Liang Jingkun and Xu Xin emerged the pair to claim the men’s doubles top prize. It was a day dominated by the super power of the sport; when play closed, one fact was certain; all five titles would finish in Chinese hands. …………Zhu Yuling, the top seed, saved one match point in the decisive seventh game against Chinese national team colleague, Liu Shiwen, the no.4 seed (5-11, 11-9, 8-11, 8-11, 11-6, 11-9, 12-10) to book her place in the women’s singles final. …………The reign of Wang Manyu came to an end; the no.3 seed, in the second all Chinese women’s singles semi-final she was beaten in five games by Chen Meng, the no.2 seed (11-9, 11-9, 11-7, 7-11, 11-5); the margin of victory very similar the quarter-final contest one month earlier at the Seamaster 2018 ITTF World Tour Grand Finals when Chen Meng had also prevailed in five games. 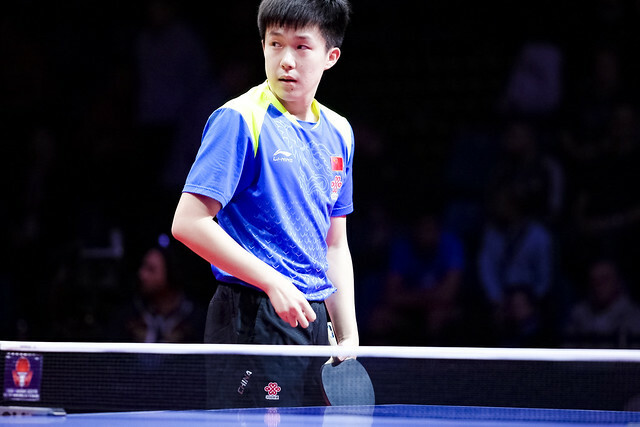 …………On the last day of May at the Seamaster 2018 ITTF World Tour Kaisa China Open, in the opening round of the men’s singles event China’s Xu Xin had lost to Korea Republic’s Lim Jonghoon in five games; in Budapest he extracted revenge. The no.2 seed, he beat Lim Jonghoon, the no.12 seed in straight games (13-11, 11-9, 11-7, 11-8). …………A first ever meeting, China’s Lin Gaoyuan, the no.3 seed, overcame Vladimir Samsonov of Belarus, the no.10 seed, in six games (10-12, 11-7, 7-11, 11-9, 12-10, 11-9) but he did have a nervous moment. In the fourth game he led 10-4, lost the next five points, elected for “Time Out”, duly won the next to level the overall match score at two games each. …………China’s Fan Zhendong, the top seed, endorsed the fact that he has eyes set firmly on retaining the men’s singles title. At the quarter-final stage he ended the hopes of Russian qualifier Alexander Shibaev (11-8, 11-3, 6-11, 11-7, 11-8). …………Wang Chuqin, the runner up one year ago once again showed his liking for Budapest; he emerged the one men’s singles qualifier to reach the semi-finals; in the round of the last eight he accounted for Brazil’s Hugo Calderano, the no.8 seed (5-11, 11-6, 11-8, 11-4, 12-14, 11-5). …………There was to be no fairy-tale ending for the host nation’s Adam Szudi and Szandra Pergel; the no.8 seeds, they were beaten in the mixed doubles final by China’s Xu Xin and Szandra Pergel, the no.5 seeds (11-3, 11-6, 11-5). …………Together for the first time as a unit at an open international tournament, Liang Jingkun and Xu Xin, the no.5 seeds, claimed men’s doubles gold. In the final they beat Chinese team mates Fan Zhendong and Lin Gaoyuan, the no.2 seeds (11-5, 11-9, 11-7, 5-11, 11-8).